One of the most fundamental components of human movement is squatting. If you go back in history people would squat to work, to have babies and to go to the bathroom. Now we sit in chairs to work, lie in beds to have babies and sit on toilets to use the bathroom. The problem with us not squatting is that we do not utilize our pelvic floor in the proper position. Pelvic floor dysfunction is talked about quite frequently these days and a lot of it is due to the fact we just don’t squat any more. Remember that a proper squat involves having your buttocks a couple of inches off the floor and holding it while you breathe properly. Our pelvic floor is pretty much in a descended (downward) state putting pressure on nerves that run through the area. A research study (Zacharin 1977) in which Chinese female cadavers from low socio-economic groups were dissected showed that stress incontinence and hemorrhoids were pretty much non- existent. 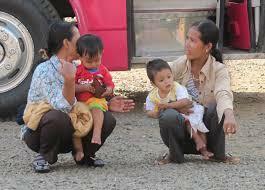 You see in third world countries squatting is fundamental to their lives. They squat while eating and working, suffice to show they rarely have any of these ailments (hemorrhoids, incontinence, etc.). Another similar study showed similar findings stating the low incidence of stress incontinence was due to tissue quality, possibly due to hard work, minimal obesity and squatting (Sapsford 2001). The advantages of squatting includes protecting the nerves that control the prostate, bladder and uterus from becoming stretched. Another benefit is reversing hemorrhoid development, as shown by published clinical research. It also makes going to the bathroom easier and complete by relaxing the puborectalis muscle and putting your colon in a more optimal position. When we talk about improving the pelvic floor we also have to talk about improving the diaphragm. Research shows that the pelvic floor is moving during all phases of breathing but it is most active during mid and end phase of breathing. The emphasis on breathing thru your nose (turns on the diaphragm) and exhaling thru your mouth (turns on transverse abdominals and internal oblique) are of upmost importance. What you see when most people squat is they will go into lumbar lordosis (inward curving the lumbar spine) which will put your pelvis in a descended state (poor position). Another improper technique is breathing in thru their mouth which will further put their back into extension. Not to mention that incorrectly breathing will overuse your external obliques and rectus abdominals. Contrary to what you see on late night infomercials these are your dominant abdominal muscles that we don’t want as they will keep your pelvis in a descended state (KL Boyle 2010). We want to turn on your internal obliques and transverse abdominals to enhance the pelvic floor based on evidence based research (KL Boyle 2010). With your typical bodyweight squat you want to drop your hips as deep as possible in order to achieve full hip internal rotation. You then want to inhale thru your nose with your tongue touching the roof of your mouth when you squat down and exhale out thru your mouth when you stand up. This way of breathing is extremely challenging because when you inhale and squat down it allows the posterior pelvic outlet to open which will allow our pelvic floor to lift up (ascend). This also allows us to train the correct abdominals as discussed above in the correct position to enhance the pelvic floor. If one has a bad back I would recommend to squat inhaling thru their nose as they go down and hold that position for 2-3 breaths and then exhale as you come back up. The diaphragm and first two ribs work together securing your rib cage which will keep you from cheating with your back. Remember that proper squatting is beneficial in improving the pelvic floor which can prevent stress incontinence and hemorrhoids. For free research based fitness and program design advice check out our YouTube channel at heartfitfmt.com. Nueman P. Pelvic floor and Abdominal Muscle interaction: EMG Activity and IAP Int Urogucenol J 2002: 13: 125-132. Hodges PW, Sapsford R, Pengel, LHM. Postural and Respiratory Functions of the pelvic floor muscles. Nuerourol. Urodynma. 26 :362-371, 2007.